"commited to affordable luxury travel"
We are a privately owned family company based in Gweru in the business of providing affordable luxury coach travel and executive coach hire services around Zimbabwe. We operate modern, equipped and well maintained buses to required standards by the Traffic Act of Zimbabwe which gives our valued customers the assurance of a safe travel. Comfort and luxury are the key aspects that guide our vehicle purchases. All this we do because cusomer satisfaction is not just our main focus but a value we need you to remember us for. 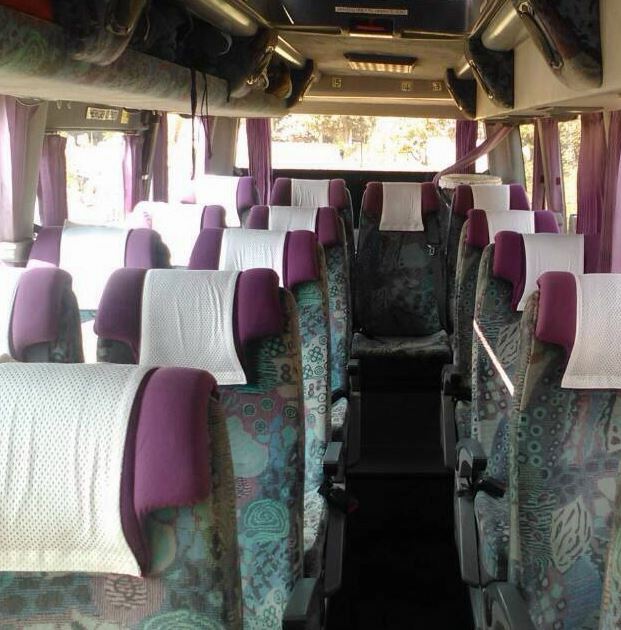 16 seat minibus fitted with air conditioning, reclinign seats, night reading lights, a power assisted passenger door and a radio. Each seat has full three- point seat belts. It has a large luggage area at the rear. This vehicle is an excellent choice for sightseeing, site visits, private hires, day trips and church trips. Whether travelling as a sports team, going for a church camp, sight-seeing, school trips, attending a corporate event or simply going to watch the game with a group of friends, our coach or car hire service will guarantee you travel in luxury and arrive in style. We operate modern, equipped and well maintained buses to standards well above the requirements of the Road Traffic Act of Zimbabwe to guarantee your comfort and safety. Copyright © 2019 Mupini Transport. All Rights Reserved.